Here is a Colombian girl who loves Korea so much. 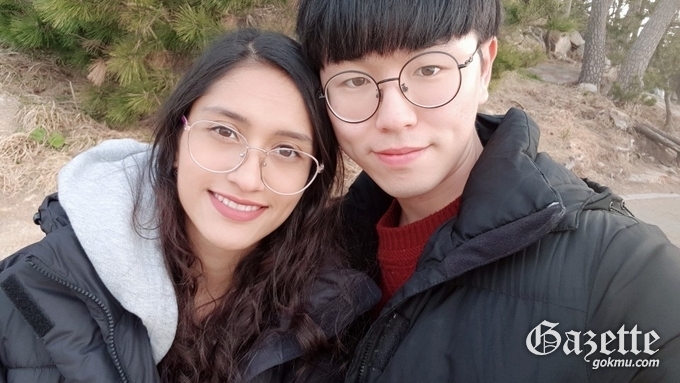 She studied Korean in Colombia for nine years and she has a Korean boyfriend. She is now an exchange student at Keimyung University. I was curious about her, so I interviewed her. I asked her why she studied Korean in Colombia and how she met her Korean boyfriend. When I interviewed her, I was surprised at her Korean ability. Her Korean pronunciation was very fluent and she has a good vocabulary. Below is the interview. Hello, I'm Lina Sinuco. I was born in Bogota, Colombia in 1997. I'm currently majoring in politics and international relations in Santo Tomas University, and I came to Korea as an exchange student. 2) What made you first study Korean? I started to learn Korean nine years ago by myself because my friends got interested in Korean music. I also became interested in Korea and started researching Korea. I completely fell for Korean culture, so that's why I started to learn Korean. 3) How did you study Korean in Colombia? In Colombia, there weren't a lot of institutions that taught Korean, so I started learning by myself. Then later, I studied in the Sejong Institute for about eight years. 4) Do you have difficulties or limitations when you talk to Koreans in Korea? Until now I can say that the only difficulty that I've had is the dialects. And as I’m a foreigner, not everyone talks to me, but I guess that time will change everything. 5) What was your favorite thing about coming to Korea? My favorite thing was to see all the monuments, all the historical places that made me feel like I was in a dream. 6) What is the best way to study Korean in Colombia? The best way to study is to find a Korean language institute, start from zero and then start meeting Korean friends to improve your skills. 7) How did you meet your Korean boyfriend? We met in a Cafe in Colombia two years ago when he went there to study Spanish, we studied together and we helped each other learn our languages. 8) Since you started dating your boyfriend, have there been any changes in your Korean language ability? Yes, I can say that my Korean speaking ability has improved a lot. Every day I learn new words, new expressions. I'm more immersed in Korean culture getting to like foods that are rare in my country, music that I've never heard, learning Korean manners and learning a little bit of dialect every day.